This entry was posted on Thursday, April 14th, 2011 at 2:13 pm and is filed under The Sustainable Spa. You can follow any responses to this entry through the RSS 2.0 feed. You can leave a response, or trackback from your own site. « Is Your Spa Poised for Prevention? Without investing large quantities of time, energy, and money, you can implement easy, efficient gardening techniques that produce the highest yield possible for the space you have available. 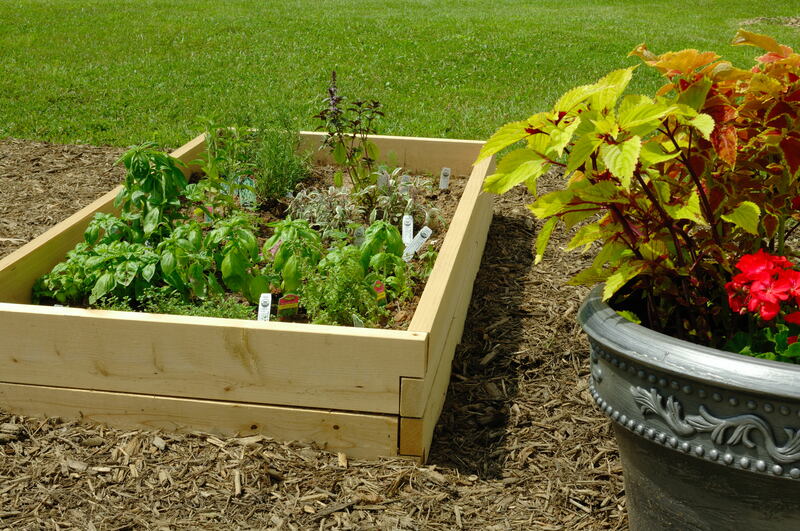 This can be done by constructing raised beds or stationing a series of Earth Boxes. Natural “pesticides” include beneficial insects (e.g., ladybugs, lacewings, praying mantises) and birds. You can invite most beneficial insects by planting certain annuals (e.g., marigolds, calendula, cornflowers, and zinnias) nearby or by purchasing a “starter community” online. Birds are easy to attract—place a few seed feeders within the vicinity of your garden and keep it filled with black oil sunflower seed. In addition, you can try plant variety and crop rotation. Pests are often plant specific, so to prevent them from taking up residence in your garden, plant a variety (such as tomatoes, eggplant, and cucumbers) and rotate the next year with another selection (maybe potatoes, lettuce, and peppers). Insects that have wintered over will not have a free meal the following year. Although infrequent, weeds sometimes sprout in raised beds. But because raised beds contain very loose soil, weeds are easy to pull up—no strenuous tugging or digging necessary. Earth Boxes do not require weeding. Nutrient-rich kelp meal, bat guano, manure (from a farm that raises animals on hormone-, antibiotic-free, natural, vegetarian diets), and compost are great fertilizers for organic gardens. Note that a rolling compost bin is easiest for a busy spa because it can be placed next to the garden, it just needs a quick spin, and it’s discreet. For in-depth information on composting, visit HowToCompost.org . Once your spa has its very own organic garden, you can boast about the vitamin-packed vegetables it produces on-site. Adding phrases to your marketing materials such as “specifically grown for you” or “nurturing hands and nourishing food” strongly addresses your spa’s mission: to provide soothing holistic services and wholesome, sustainable cuisine. Plus, by offering homegrown goodness, your spa is no longer just a spa—it’s a dual focused treatment center, dedicated to the total health and well-being of its clients. We don’t have an organic garden in our spa, but we do bring fresh herbs from our home gardens which we dry, pulverize and use in our body treatments. Occasionally, we will add some home grown mint in our waiting room beverage options. Thank you for posting this fantastic idea for spas that may not have the space to build a raised bed. I bet your clients really appreciate the benefits fresh herbs.